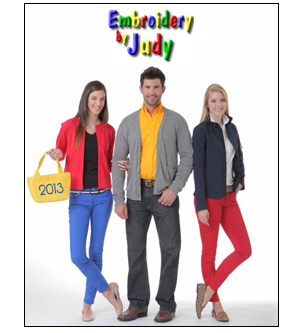 Welcome to the Embroidery by Judy product catalog page. I offer a variety of products that represent the very best in sports apparel. Because my quality control standards are high, I select only the highest caliber sportswear, coats, hats and bags. My goal is always to deliver “Quality In Everything I Do”. Your satisfaction is of paramount importance. Please contact me for the latest catalogs for all your embroidery needs.